As part of the Jacksonville Transportation Authority’s (JTA) MOVE initiative, JTA is advancing a suite of system enhancements called NEXT (Network of Enhanced and Xpanded Transportation) on Monday, December 3, 2018. The First Coast Flyer Bus Rapid Transit Red Line’s San Pablo Station. 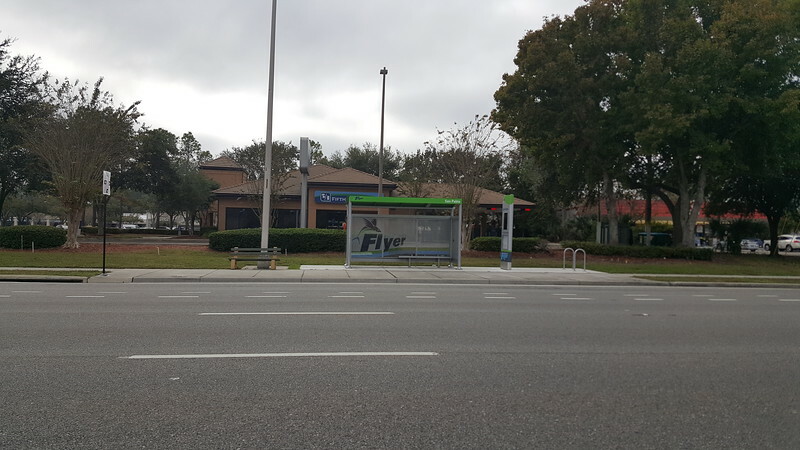 JTA’s First Coast Flyer Bus Rapid Transit Red Line will operate between Rosa Parks Transit Station and the Beaches along the Arlington Expressway and Beach Boulevard with stops at major destinations, including Florida State College Jacksonville South and Downtown Campuses. 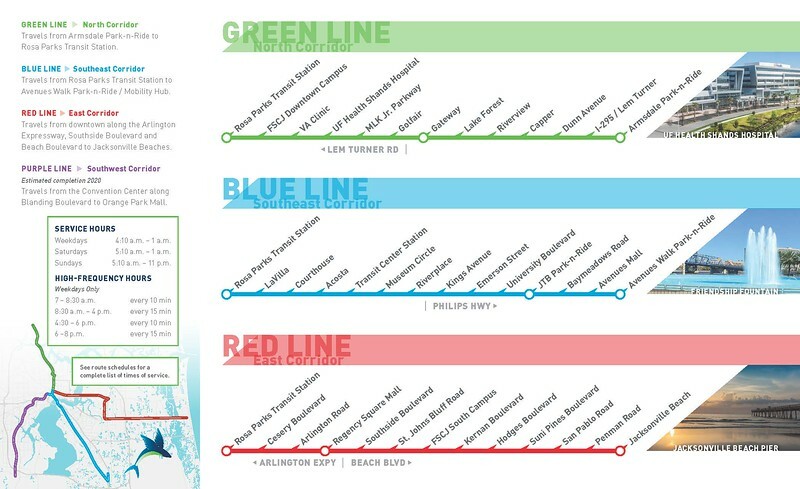 The Red Line will replace Route 9. The 18.5 mile Red Line nearly doubles the footprint of the existing First Coast FlyerTM system, connecting more people to jobs, education, healthcare and entertainment. The Flyer makes fewer stops and offers 10-minute frequency during weekday peak hours and 15-minute frequency in weekday off-peak hours. The Red Line will offer complimentary Wi-Fi, MyJTA mobile ticketing, onboard monitors with real-time news and other information. 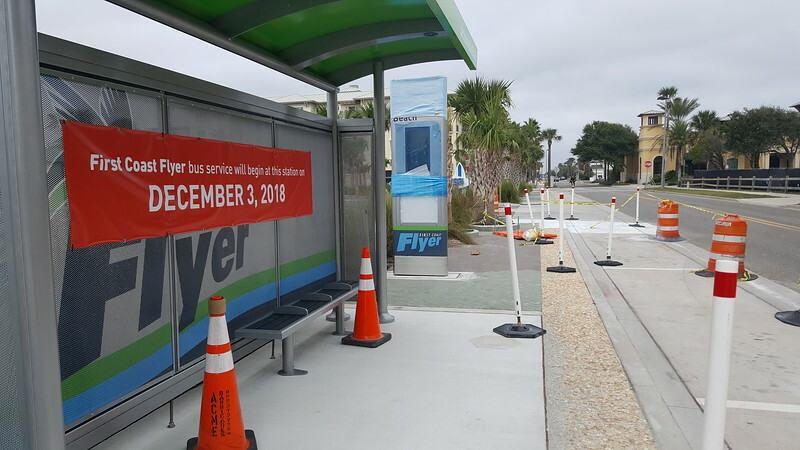 Along with the launch of the Red Line, the Avenues Walk Park-n-Ride will open to serve the First Coast Flyer Blue Line. The new park-n-ride is located at 10508 Avenues Walk Boulevard and will feature parking for 88 vehicles, First Coast Flyer branded stations, bike racks, totems, ticket vending machines, solar trash and recycling and energy efficient LED site lighting. 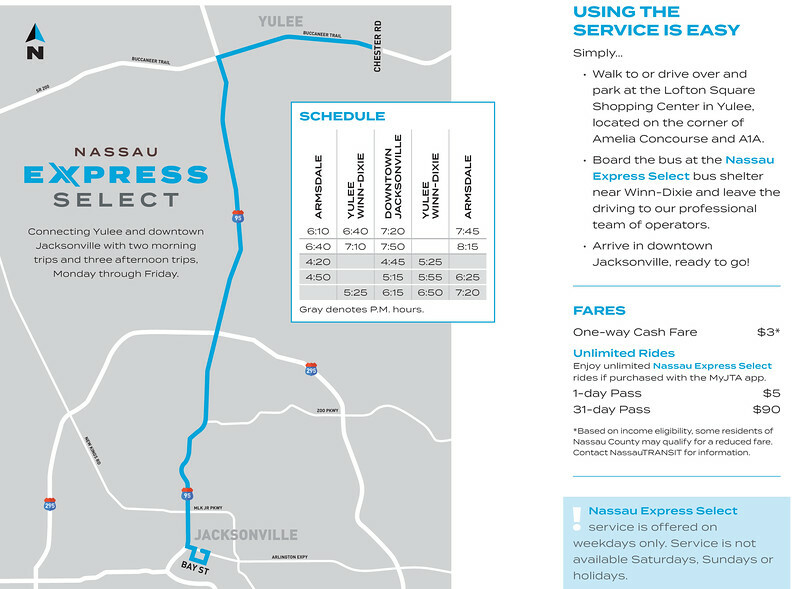 The third new service is the Nassau Select Express powered by JTA and Nassau Transit. The service will operate two trips in the morning and three trips in the afternoon, Monday through Friday between Yulee and the Rosa Parks Transit Station. Vehicles will be equipped with complimentary WiFi, USB ports at seats and Real-time Passenger Information via NextBus. All vehicles will have 13 passenger seats and are equipped with wheelchair accessibility. The fourth component of the NEXT initiative is ReadiRide, a new, alternative service offered by JTA through Owl, Inc. that will replace the Community Shuttles. ReadiRide will provide affordable, on-demand transportation to customers within five zones including the Beaches, Highlands, Northside, Southeast and Southwest. Customers can choose one-way or round-trip rides from a home, business, bus stop, curbside or anywhere in the service area. ReadiRide will operate Monday through Saturday from 6 a.m. to 7 p.m. Customers will schedule trips directly through Owl, Inc.
Additionally, as part of the service changes, the Northside, Highlands and Southeast Community Shuttles will be replaced with three fixed routes (84, 85 & 86). Community outreach specialists are available at the Rosa Parks Transit Station and transit hubs to answer questions and assist customers with all the service changes. Customers may also call the JTA’s Customer Contact Center at 904.630.3100; Florida Relay at 800.955.8771 or visit www.jtafla.com.